MEETING POINT IS PLAZA ANIBAL PINTO IN VALPARAISO. 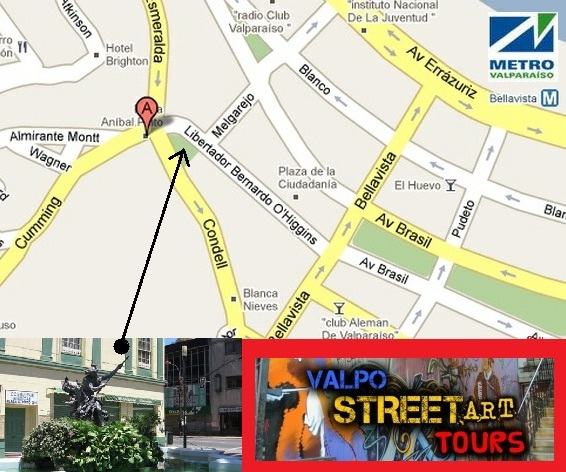 THE GUIDE WILL HAVE A NAVY BLUE GRAFFITI TOUR SHIRT ON OR A HAT WITH THE "Valpo Street Art tours" logo. If you can't find us, because of an event or something like that, look behind the monument and we'll be hiding there. YES -- with at least 12 hours anticipation. Now, when you book the night before at 1 am, for a 9 am tour, don't expect to have a red carpet at the door of your accommodation (this happens very, VERY often). We'll try our best to accommodate you. Yep, extremely; this is like that movie "city of god". KIDDING AGAIN... However, please don't wear flashy jewelry and don't bring the "Louie" along for the tour. IT'S A SUB-CULTURE TOUR; YOU WOULDN'T GO TO A PUNK ROCK SHOW LIKE THAT. If you would, then Ok, responsibility's on you. CAMERAS ARE DEFINITELY OK and YES, YOU CAN TAKE PICTURES OF THE ARTISTS AND OF THE WORKSHOP. Actually, If you don't take pictures we'll be offended... but not really. However, if you took the time to take a picture of a sleeping dog (you know you did), at least snap one at a mural or something (or a sleeping dog with a mural behind it). Are you guys even serious? ... but yes, we are very professional, and we love you (but only if you are nice to us on TripAdvisor. If not, we won't love you... there are a few people we're hating right now). - WHAT IF I HATE THE TOUR*? You don't pay if you don't like the tour... but don't spit on us. - WHAT IF I LIKE IT ALOT? Then you can tip and/or get the guide a beer... all's welcome. You can't show up to a tour with a long face! It's a tour -- on one side, you're travelling; you're meeting people, and seeing new places. You should be thrilled that you came all the way to Valparaíso, Chile... Please, appreciate that first, and then go on a tour. On another side we work from too early, until very late, every day of the week and ignore our families many times, to make sure you have an awesome time. We can't provide that if we try but you don't show up wanting to see the city from a different perspective. DO YOU DO ANYTHING FOR YOUR COMMUNITY? OR DO YOU POCKET ALL THE CASH FOR YOUR PERSONAL "NECESSITIES" LIKE THE REST OF YOU TOUR OPS'? Ok, so, people think that we are like your average business where you pay, and we go out to get drunk. That is only partially (70%) true, as we have been active in our community, helping kids get OUT of crime, and IN to Graffiti. We work with the "Juvie", and privately with cases that we know of. We don't help all-day, everyday, because we're not doctors or goverment workers; we do what we can, and we try to do it as often as possible. If you're an arrogant artist or some idealist who thinks we "exploit" our city, then you don't know us, and you need to take one of our tours before you talk smack... or simply shut up. Does the Graffiti Community agree with what you do? Some people do, some don't. Many think we're becoming millionaires, when in reality, it's been very hard to market this concept. It's taken us years to get people to understand that "We mean no harm", "It's fun", "It's a REAL down to earth experience", "'Group rates' means that you sometimes take 10 people for the price of 3". ... But we stay on the streets; we stay helping the locals. We help tourism for our city; therefore, we sleep great at night. What if I like your idea and want to do a street art tour myself? It's happened... and it's happening right now. People think they can just print out some panflets, drop them off at hotels and hostels, and you're now in business... when in reality, there is so much more to this. As professionals in the tourism industry (i.e. you drop us off anywhere in the world and we can structure and create tours, and survive) We like to think that all of these years of hard work and being here since before the hostels opened (circa 2006) deserve some respect. Sadly, our government does not always regulate who directs tours, and for the most part, guides are just people showing you stuff for money. We love tourism and we love the art of guiding... so if you think you can just show up and start talking about "murals", you're treating our beloved industry like your personal washcloth... and we don't like that. This tour is led and created by Graffiti Artists and Graffiti Writers. Since we launched this tour, we have been through heaven and hell to get people to respect what we are trying to do (in the streets as writers and artists), and we have paved the way for many graffiti tours in Valparaiso and for Chile in general. So, if you want to ride our wave, at least talk to artists and writers first. Plus, if you think the tours are only about showing murals, you're way off. Valpo Street Art Tours helps the Graffiti community a bit more than the street artist community, because it's where it all starts. Without graffiti, you don't have street art, so, respect for the streets is a big thing around here. So, ask your other tour company if they paint; if they've ever had a close encounter with the police, or if they even give a peso back to their city. Have they ever cleaned a plaza which they take tourists to? These things are very important in the tourism industry, and we're proudly present in all of the above. That's why you should always walk around with licensed guides. We wouldn't go to another country and travel with some weirdo with a panflet... watch that hostal movie and you'll see what we're talking about.